Surat : The bodies of all seven Amarnath Yatra pilgrims killed by terrorists in Jammu and Kashmir arrived here on Tuesday as the Gujarat government announcement Rs 10 lakh compensation to the kin of each of the dead. Gujarat Chief Minister Vijay Rupani, who received the bodies at the city airport, was full of praise for Salim Shaikh, the driver of the private bus who kept driving for at least two kilometres to the nearest Army camp even after coming under attack on Monday. "We will recommend a bravery award for Salim who drove the bus two-to-three kilometres and saved the lives of the other 50 persons," the Chief Minister said. 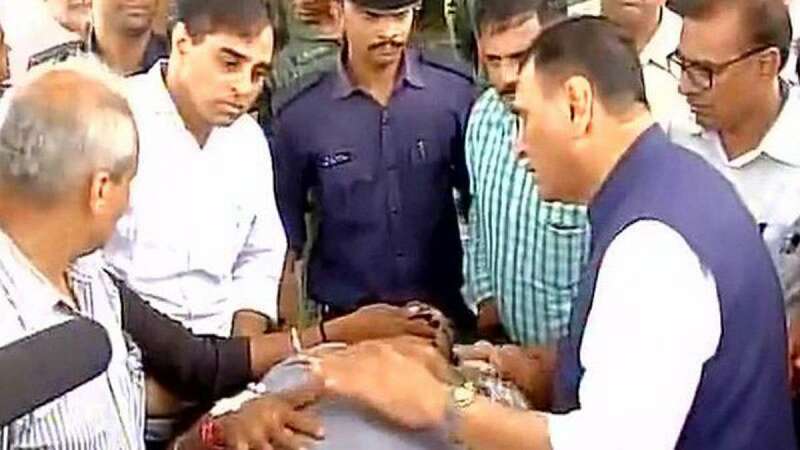 Rupani received the bodies along with 19 injured pilgrims and 32 others who were flown from Srinagar. Accompanied by Deputy Chief Minister Nitin Patel and Gujarat BJP president Jitu Vaghani, the Chief Minister met every injured person and expressed his sympathies with them. Rupani also spoke to the Jammu and Kashmir government to ensure that proper care was provided to the injured hospitalized in Kashmir. On Monday night, six women and a man were killed and 19 others injured when militants attacked an unescorted bus from Gujarat at Khanabal in Anantnag district on the Srinagar-Jammu highway. Two of the women were from Maharashtra while the others belonged to Gujarat. The bodies of the two Maharashtra women will be later sent to their hometown. Of the 19 injured, eight were from Maharashtra. Meanwhile, all the scheduled programmes of the ruling BJP in Gujarat were cancelled. BJP President Amit Shah, who was to address a meeting of thousands of BJP workers at the state capital Gandhinagar, cancelled the event. Ram Nath Kovind, the Presidential nominee of the BJP-led National Democratic Alliance, cancelled his visit to the state to canvas for the July 17 election. The Gujarat government has activated helplines for the Amarnath victims. The numbers of the Helpline Desk started at the Gujarat Police Control Room are 079-23251908 and 1070.